I had a great email discussion this week with some of my younger colleagues here at West Hills. They are all so smart! So passionate! So willing to discuss and wrestle… Their parents should be proud and I know they are. …the liturgy was more of a timeless aspect of our worship. As a kid and then teen, I could feel the prayers, the liturgical songs, the actions of standing, sitting, praying, responding, receiving were starting to ingrain themselves in my very body. I remember myself starting to set the hymnbook down more and more. I would simply pray or sing or respond. The phrases like “And also with you” or “Thanks be to God” or “Amen” started to come naturally and unbidden. The actions, the words, the songs…ingrained in my very body. Remembered. I think the reason I sent the blog out originally was because of the part that resonated with me most: the act of liturgy as remembering. I think we forget sometimes that the work of the people or for the people was handed down by real people who lived so long ago and set the rhythm in motion that we would remember who it was that brought us there in the first place. That we remember that the Gloria was sung by the angels to the only one worthy of it. That the bread and the cup were first lifted by the one who gave his life for us. That when we say the Lord’s Prayer it is in the words he taught to those listening to what he had to say. That when we arise and declare what we believe in the Apostles’ Creed, it is the work of ancient generations hammering out what do we believe anyway. So remembering is important to me so we can pass it on to others, just as it was passed on to us. I surround myself with touchstones of memory, not gathered to me for the importance of having stuff, but important because of what is attached to them: remembrances of real people and places that God has put in my path. 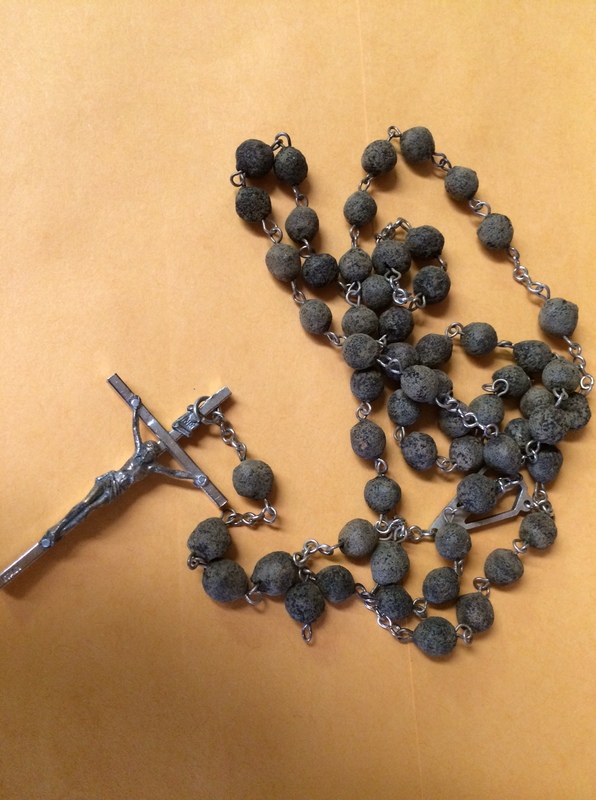 In my purse is this old rosary. It’s there next to a glow-in-the-dark plastic statue of Mary, the mother of Jesus. I need the rosary when I attend the rosary service of dear people who are Roman Catholic. It reminds me of the rosary we had when my own mother died. It even takes me back to grade school – first and second – at Christ the King here in Omaha. One service in the gym was led by Father Hupp and a human chain of rosary beads in the form of the altar boys and others. Father carried the big crucifix and they all followed behind him as we recited the creed, the Lord’s Prayer, the decades of Hail Marys, the joyful mysteries of Christ. The rhythm of that celebration is ingrained in my body. I don’t need the rosary to count; I can do that with the motion of my hands in the praying. But the rosary itself in my purse with the plastic Mary helps me remember who passed that faith on to me and helped me grow in it. 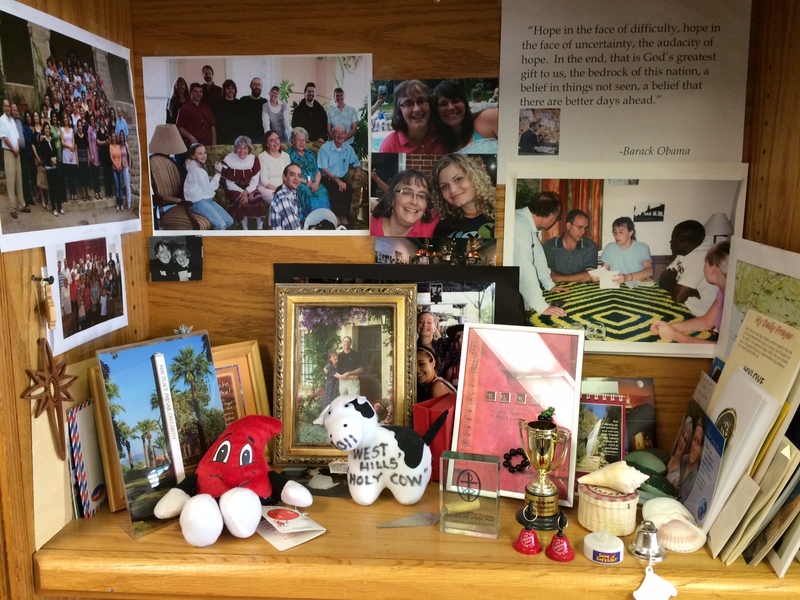 I have a credenza full of the stuff of memories. There are photos of my German daughters Fine and Johanna and Kathe who remind me that young people still come to faith and want to share it, even in another language! There is my West Hills Holy Cow award from Kathy Leach, who loved our group portrayal of the Little Sisters of Perpetual Responsibility at a Super Supper several years ago. It reminds me that others love the joy of worship with laughter. There is my reminder from Jody Filipi to “SING: make music with your hearts to the Lord,” from Ephesians chapter 5. If there is one thing I NEVER forget, it’s to sing. There is the picture of the peace pole that George Moore took for me in the Holy Land. “May peace prevail on the earth.” That pole with a prayer reminded him of me, and now the picture reminds me of him and how he knew how much I long for peace. There is a picture of me and my siblings with our dad at Easter, 2007. He stopped his dialysis the next day and went to be with mom and Jesus two weeks later. It is a reminder of how we all laughed and joked and ate a big dinner in celebration of life and then two weeks later, sat by his side together as he took his last breath in this life and was released from his earthly pain into an everlasting life. There is a framed poster from the church in Germany that represented their theme for that year, “Himmel und Erde werden vergehen. Meine Worte aber werden nicht vergehen.” (Mark 13:31) “Heaven and earth will pass away, but my word will never pass away.” It will not be forgotten. It will be remembered. There are a number of other things up there from my travels in the Middle East. There is my Druze princess hat from Byblos in Lebanon. 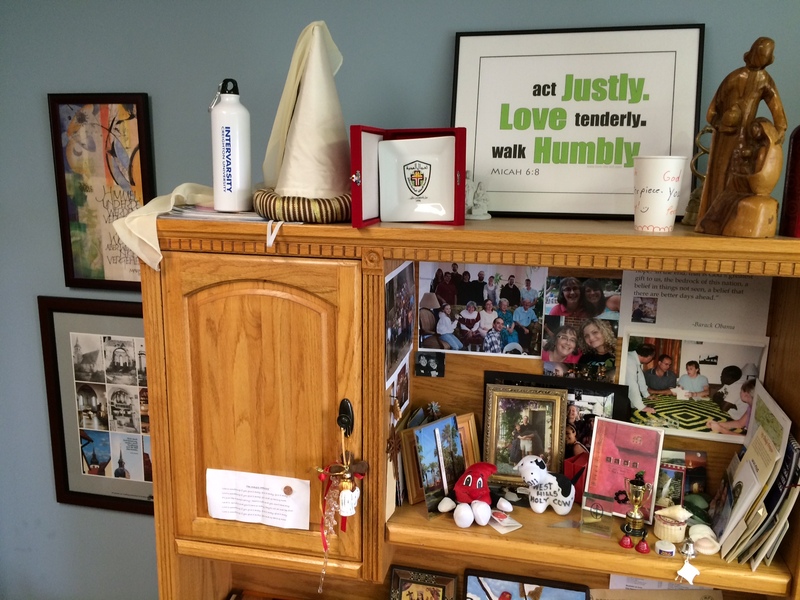 There is an acrylic plaque from the Middle East Council of Churches and a porcelain plate from the Sunday school in Damascus, Syria. The silly together with the sacred. They all remind me of names and faces of people dear to me, but even more dear to God. And next to me, on my wall, is a map of the world. The reminder is that God’s people are everywhere. His family, my family, everywhere. And the ones who handed down this faith to me started right there in the middle. 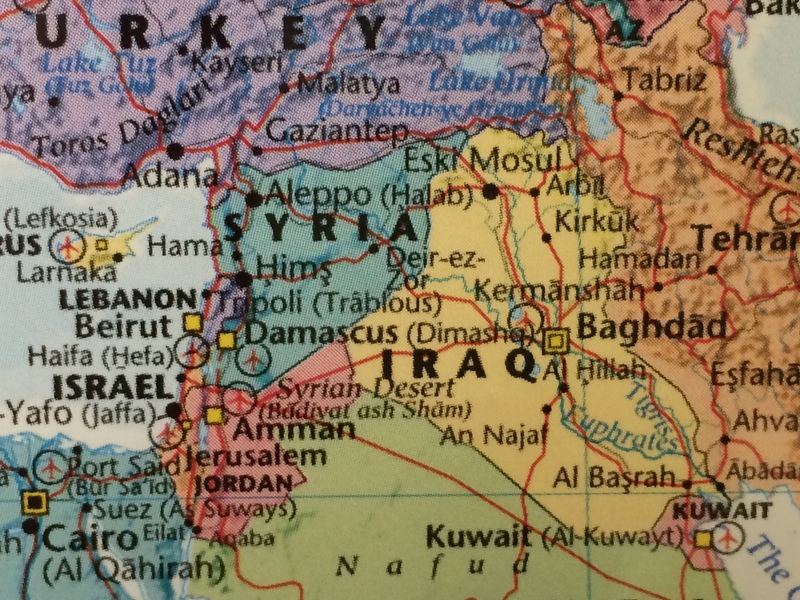 They are in Lebanon, in Syria, in Iraq, in Egypt, in Palestine. Some of them still offer their worship – do their liturgy, their remembering – in languages that go back to Jesus. And as I look at that map and watch the news, I remember that many of them are in great pain, undergoing a horrible time of trial, as they come face to face with war and death and evil. And I remember to pray. And that is my liturgy, the ingraining in my body and heart, the remembering, the work of this person. Glory be to the Father, and to the Son, and to the Holy Spirit, as it was in the beginning, is now and ever shall be. Amen. Well said! It makes me think of the “Great Cloud of witnesses” from Hebrews 12:1.